Chris Gayle and his record-breaking antics continue in the shorter format of the game. People will fall short of superlatives to describe the massive West Indies swashbuckling opener. The explosive batsman on Tuesday smashed an unbeaten 146 runs off 69 balls for Rangpur Riders in the final against Dhaka Dynamites to help his team lift the Bangladesh Premier League 2017 title. With this feat, he also became the first batsman to breach the 11,000 run mark in T20 cricket. The closest player next on the list is Brendon McCullum, who has 8526 runs in his kitty from 309 matches. Gayle also hit a mind-boggling 18 sixes in the match which is also a record in itself. He now has 801 T20 sixes to his name. The previous record for the maximum number of sixes in a T20 match was also held by Gayle when he smashed 17 sixes for Royal Challengers Bangalore against Pune Warriors during Indian Premier League (IPL) 2013. Social media went into a frenzy after Gayle surpassed his own record of hitting maximum sixes in T20s. Its a rare opportunity to watch or commentate on two magnificent 100s by Gayle in three innings. That was exactly the privilege afforded to me in the @Official_BPLT20 final Rangpur vs Dhaka. 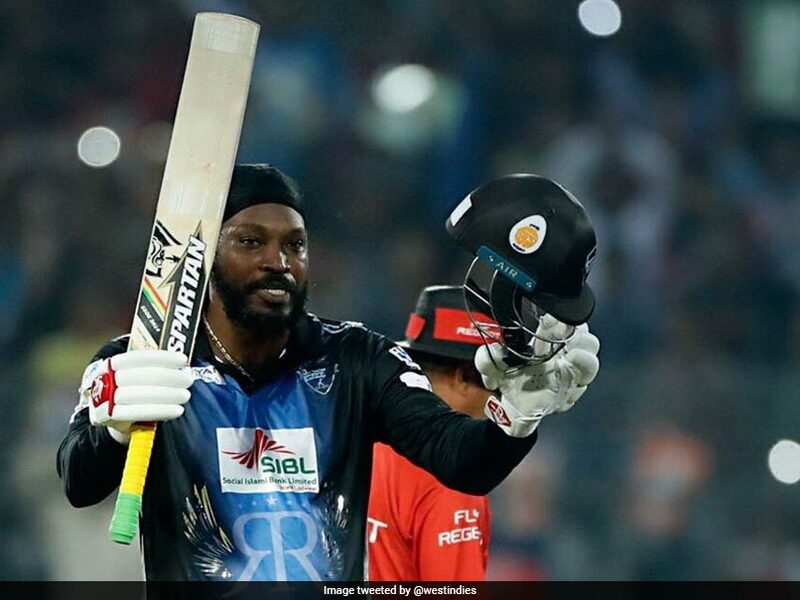 Put into bat first, Gayle’s Rangpur Riders posted 206 runs for the loss of one wicket in their 20 overs. Fellow Windies batsman Johnson Charles departed for 3 in the second over as Shakib Al Hasan struck for his team. However, it was after his dismissal that the towering Gayle hammered the bowlers at will to the boundaries. Aided by Kiwi batsman Brendon McCullum (51*), Gayle smashed four boundaries and hit 18 maximums. Gayle made his T20 debut against New Zealand at the Eden Park on February 16, 2006. The Caribbean is also the only player to score a T20 international century, an ODI double century and a Test triple century.